Phoenix Flies 2019 is only a year way. Here's are some places I'd enjoy seeing at the next #phoenixflies. To my knowledge they've never been on the tour. 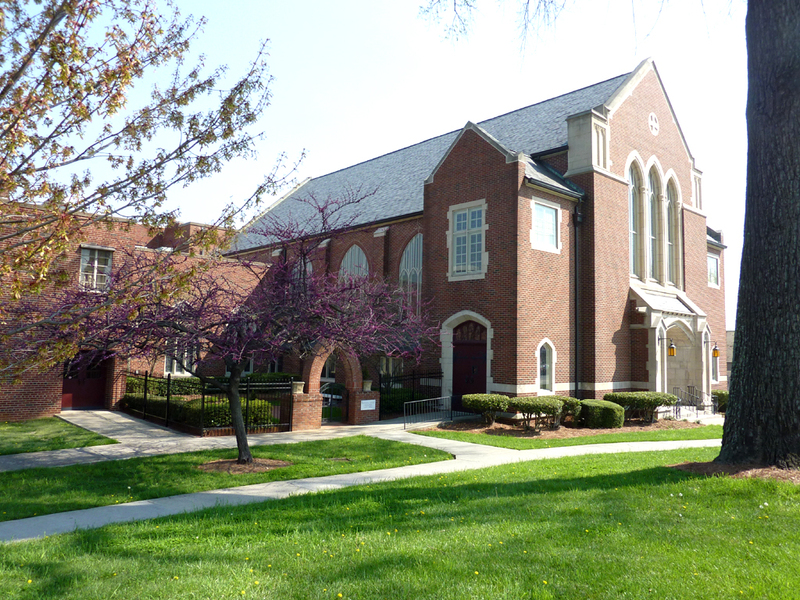 St. Paul's Presbyterian is a landmark a block from the Fox. One of our four Hopson designed churches. It's been home to several churches and a restaurant. It needs some $love. Grace United Methodist Church by Francis Palmer Smith, big stained glass, big organ, great acoustics, muscular shoulder-pad street-front appearance, parphrasing Robert Criag who wrote the book. 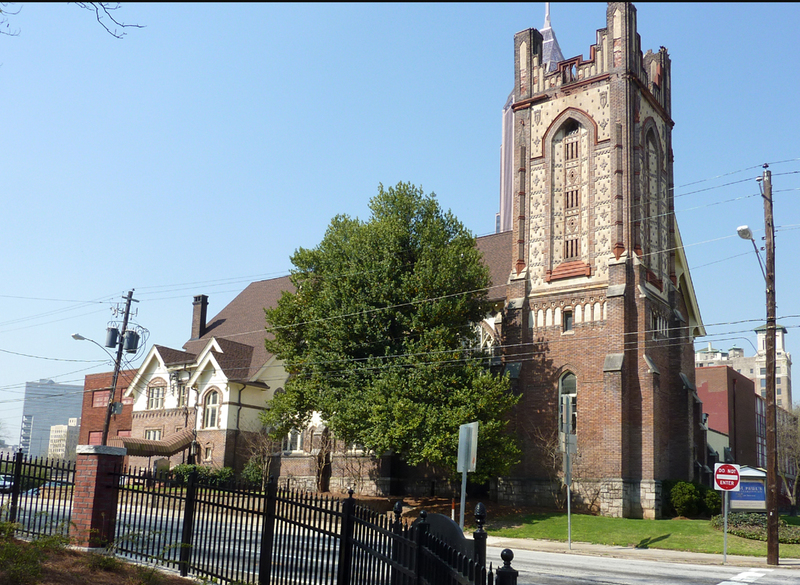 Church at Ponce & Highland formerly Druid Hills Baptist is at one of Atlanta's most picturesque corners, a 100% corner - per Dhiru Thadani. 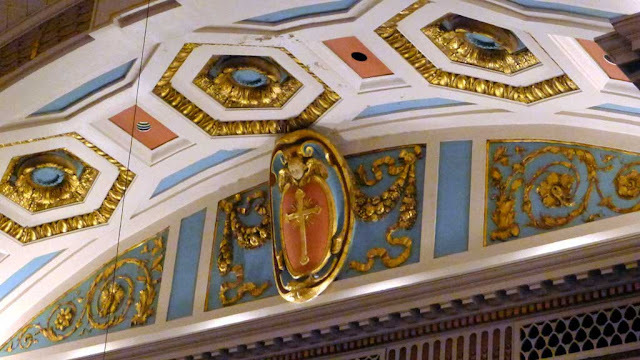 By same designers at First Church of Christ Scientist. 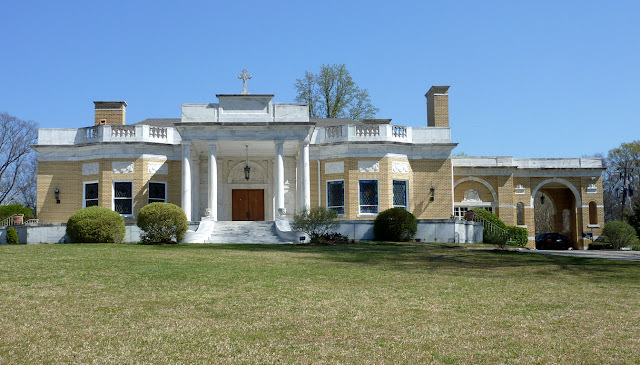 Church at Ponce & Highland formerly Druid Hills Baptist: MUST SEE INSIDE. 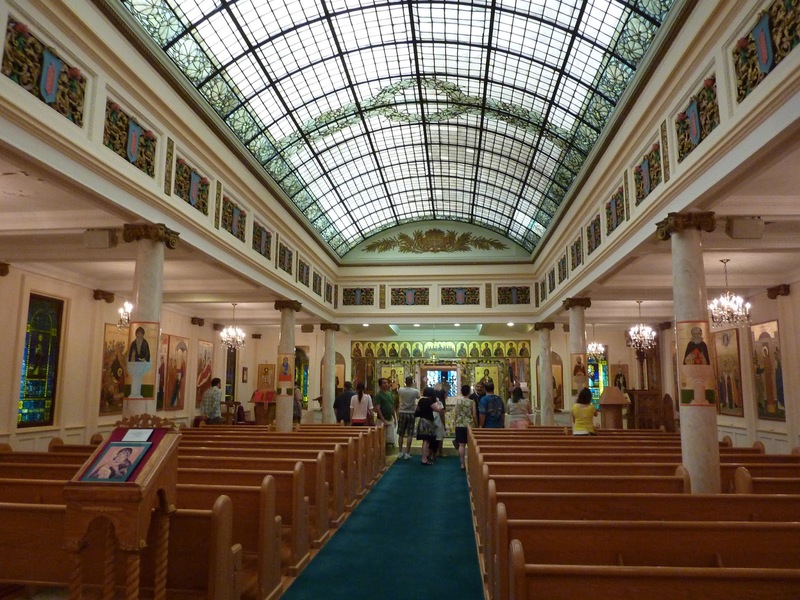 Saint John Chrysostom Melkite Catholic Church was a glorious Candler Mansion, now a glorious church. Inside Saint John Chrysostom, a high style family home that had a bowling alley. Is the Episcopal Church of the Epiphany in the City of Atlanta? I don't know but the congregation used to meet on Seminole in Little Five Points. When folks ask me what to see during Atlanta Preservation Center's #PhoenixFlies 2018 I say the churches. There are 16 church tours this year. Here are links to the online Phoenix Flies 2018 Program to the Phoenix Flies 2018 Event Cards and to the Phoenix Flies 2018 Daily Calendar Cards. It's big. Francis Palmer Smith's magnum opus. Stained glass by the acres. Another Francis Palmer Smith. Two words: Hammer beams. 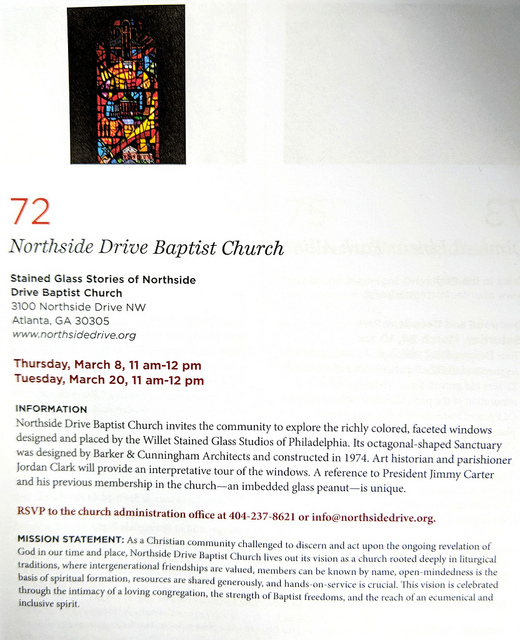 You'll get a church tour, a stained glass tour, and some honking big organ. Sometime you go in the pipe rooms. Not just a church tour but the current "First Existentialist Church ," aka the "Old Stone Church" goes deep. 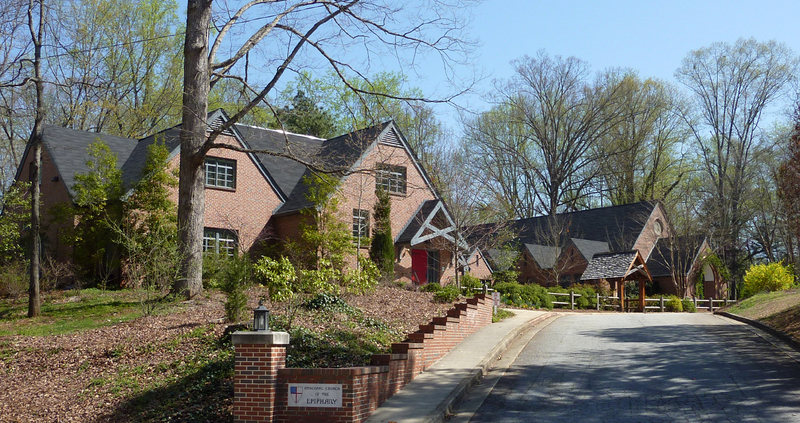 There's not a prouder structure on Peachtree, every brick and mortor-line has a purpose. Inside: An ethereal space with a dome. Combine this tour with Tour 40 for a same day two-fer. Glorious stained glass with handful of Tiffany windows. Combine this tour with Tour 39 for a same day two-fer. 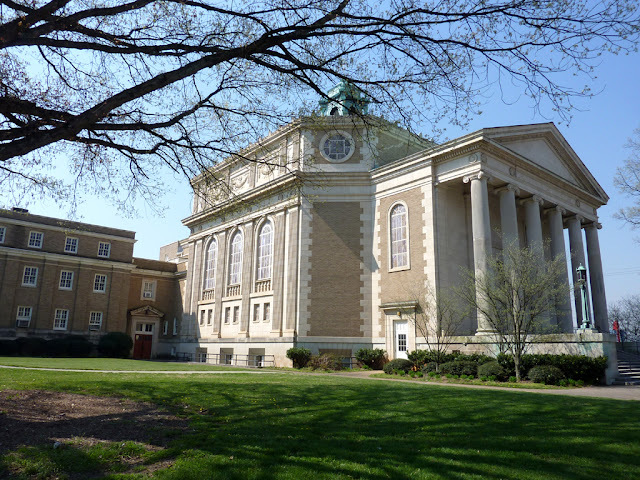 Glenn's main sanctuary is workaday and doubles and Emory's auditorium. The Steeple, and the dignified exterior reward every drive by. But Shutze's "Little Chapel" is a cathedral in 900 square feet. Shutze based the design on St Stephen Walbrook by Sir Christopher Wren: how to "dome a square." One of the Charles H. Hopson churches and a Peachtree landmark. Spectacular inside. Must see ceiling. Buckhead, kind of hidden, looking forward to my first visit. Spectacular and you'll hear the great organ. Combine this tour with Tour 90 for a same day two-fer. Midtown landmark at 5th and Peachtree. Must see inside. In Granite on Grant Street in Grant Park. Have you seen it, seen inside? Stunning sanctuary. #notliketheothers One of the three "Jesus Junction" Chruches, a tall steepled landmark in white. Yes, the congregation used to meet on Ponce de Leon. Shutze landmark with big-time heritage and history. The 1958 bombing is remembered in "Driving Miss Daisy," On the St. Luke's property it pokes out into Courtland Steet. Combine this tour with Tour 80 for a same day two-fer.